Books from Lomakov`s Cars and Motorcycles Museum Library ( books about oldtimer autos and motorcycles, classic cars, veteran cars). And you buy copy it books. 1. "Motorcycles Harley-Davidson and BMW. Leaving, adjustment and contents in serviceability". Korzinkin. Practical manual. USSR, 1933 . Figures, circuit, table. A copy on 48 sheets of a format A4 (95 pages in the original). The price: 29 Euro . Kind of the book. 2. " German motorcycles ". Postnikov. USSR, 1941 год. A copy on 24 sheets of a format A4 (51 pages in the original). About BMW, Zundapp, NSU, DKW, Triumpf. The price: 21 Euro. Kind of the book. 3. " The brief operation manual for ZiS-110 ". USSR, 1947 . A copy on 24 sheets of a format A4 (48 pages in the original). Price: 30 Euro. Kind of the book. 4. "Automobiles and motorcycles in Russia 1896-1917". Size book 220 x 145 mm. Small amount of the books! The price original book: 32 Euro. *** This book, and some other, We can exchange for other, your book about antiquarian automobiles and motorcycles ! 5. "Automobiles Russia and USSR". Size books 300 x 220 mm. Price original book (no cope): 100 Euro. ***Or This book, and some other, we can exchange for other, your book about history automobiles and motorcycles .
" Harley-Devidson Rider`s Hand Book ". (35 pages in the original). There is a photos and circuits. 8. "Motorcycle. Design, theory, account". Ivanizky. USSR, 1958. 503 pages. In the book are described modern (till 1958) motorcycles, all their units, mechanisms and mainest details. The units Are described and are mentioned: M1A, M1M, K-55, JAVA-Chezet, Adler M-125, Guskvarna-30, IJ-49, M-31, IFA BK-350, Matchles, BSA B-31, M-52, BMW-R50, Velosette-MAG, BMW-R75, M-72, Zundapp, Viktoria "Sving" and B-35, BMW-25/3, K-125, Rummi-125, Norton, NSU "MAX", MV-125, JAVA-500, BSA-150, Puh... Price: 80 Euro. 9. " Soviet motorcycles ". Ivanizky. USSR, 1954. 345 pages of a format A4. The present book contains particular(specific) materials on soviet road motorcycles let out by an industry in the present (till 1954) time (it M1A, K-125, IJ-49, M-72) And which are let out till 1951 (K1B, IJ-350). 10. " Motorcycle K1B. The brief operation manual ". USSR, 1949. 50 pages. 12. " A Design and account of a motorcycle ", Jerusalemsky. Main edition of the auto tractor literature, 1936. 387 pages. Are described: HMZ-350, NATI-4, L-300 " Red October ", Velocette-MOV, Ariel... In the basic theory of accounts. 15. "Motorcyles K-125 and K-175". Aksenov. USSR, 1966. 17. "JAP Viertaktmotoren" . Till 1937 . 11 pages A4. Deutshe. 18. " The Device of a motorcycle. (Descriptive rate) ". Jerusalemsky. USSR, 1938. 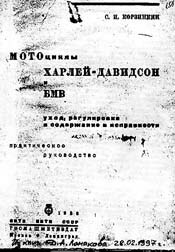 In the book the items of information on a motorcycle with reference to the program authorized by an auto Department on physical culture and sport with Advice(council) of the National Ministers USSR for rates of preparation of the drivers of motorcycles are given. The contents is illustrated by examples of designs of soviet motorcycles L-330, IJ-7, PMZ-750, TIZ-AM-600 and others..
19. " Operation and repair of motorcycles ". Ginzburg. USSR, 1956. On examples: M-72, Ij-350, Ij-49, K-125, M1A, L-300 " Red October ", AVO-425, BMW R 35. 22. " The Description of designs of automobiles of the foreign marks ". Professor Halfan. USSR, 1953. 241 pages. It, encyclopedia for an auto collector. In the given book the descriptions of designs and feature of operation of the most available trophy automobiles of German firms are given: a Audi, Horch, Wanderer, DKW, Opel, Mercedes-Benz, Adler, BMW. And also: carburettors Soleks, electric equipment Bosch, coupling of Comet -Mekano, box of switching of speeds Afon both Prometius the helmsmans ROSS and Gammer, brake ATE-Lokhid, shock-absorbers of Comets and Boge, greasing, wheel and trunk. 23. "Konstruktion traktor`s "Fofdzon", "Fordzon-Putilovez" and "Intrnational" 10/20, 15/30, 22/36". Popov. USSR, 1930. 193 pages. 186 fotos (figures). 24. " The Catalogue of spare parts of lorries GAZ-51A, GAZ-63, GAZ-63A. ". USSR. 1963. 239 pages format A4. 25. "Katalogue of parts GAZ-69" . USSR. On Four languages!!! English, German, French, Spanish. 374 pages of a format A4. 26. " 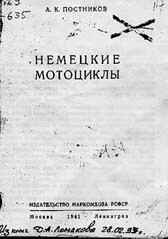 A Management(manual) on automobile transportations of parts of Red Army ", Metelkin. USSR, September 14 1941!!! Is authorized: General Jukov. 128 pages of a pocket format - 1/4 from A4. A 64-th copy! 27. " Steel and tank engineering of armies of USA, England and France. " Nersesyan. USSR, KGB, 1958. 367 pages of a pocket format - 1/4 from A4. It is a lot of a photo - 258. 28. " A Factory a ZiL and people. The director Lihachev ". USSR, "The Moscow worker", 1971. 280 pages. A history of a factory a ZiL. =39Euro. 29. " A History of a Ulyanovsk Automobile factory ", author of the text Mevedevsky. USSR, 1988. 30. "Pfares de precision et lanternes SCINTILLA". Berlin, Germany. Till 1925 . The description Automobile headlights of the specialized firm. 31. " Automobiles the soldiers ". Gogolev. USSR, 1990. 191 pages. 33. " A Temporary, brief management(manual) to gas - generating to a tractor HTZ-T2G". Levitan, Rodshtein. USSR, Scientific and technical station Harkov Traktor Zavod, 1938. 60 pages. 34. " Adjustment of automobiles GAZ-AA and ZiS-5" . Polivanov. USSR, 1948. 59 pages. 35. " Import automobiles of models 1941 - 1943 " . Krjivizky. USSR, 17 august 1945 . 540 pages. 297 fotos. The automobiles delivered in USSR from the allies till the anti-Hitler of a coalition - England and USA (that is under the law of the senators Lend and Leez) are described : Chevrolet G-7107 and -4409, Studebaker US-6-62 and -6-4, International M-5-6-318, GMC CCKW-352 and ACWX-353 and AFW-354, Dodge WC-51 and WF-32 and T-203-B, Ford WOT-8 and 2G 8T, Badford OXD and OYD, Austin K-3 and K-30, Albion BY3N, Skammel SV2S, Ford-Marmon-Harrington HH-6-COE-4, Willis MB, Bantam RC. =47Euro. 36. "Automobile "Chayka" (" Seagull " ) GAZ-13. The maintenance instruction. ". USSR, 1969 (9 editions) And other same, but 1975 (16 editions). A GAZ. 92 pages. The price: 39 Euro. 37. " The Sputnik of the driver the Gas-generator of automobiles ". Artamonov. USSR,1940. 128 pages. 38. " Famous automobiles 1870-1918 ". Kochnev. USSR, 1998. 40. "Shop manual. Dodge tracks. "W" series", Chrysler corp., 1941. English. 260 pages format A4. Many fotos. 41. "Maintenance manual. Chevrolet 1 1/2-ton (LC) 4x4 truck. ", GMC CMD, Detroit, Mich., 01 march 1942. English. 230 pages format A4. 42. "Maintenance manual. WF-32 1,5 ton 4x2 chassis Dodge truck. ", Chrysler corp., Detroit, Mich., 1941. English. 144 pages format A4. Many fotos. 44. "Leyland Retriever. Service manual" . Leyland, Lancs. , 1941. English. 230 pages format A4. 45. "Maintenance manual. Studebaker models US-6 and US6x4", Studdebaker, 01.02.1942. English. 230 pages format A4. 46. "Maintenance manual. Willys truck 1/4 ton 4x4. Model mb. ", Toledo, Ohio, U.S.A., 15.05.1942. English and Russian.152 pages format A4. 47. " The Instruction to the drivers. The brief instruction on management and leaving behind the lorry Willis model MB of 1/4 tons 4x4. ", Toledo, Ohio, U.S.A., 12.05.1942. On Russian. 16 pages of a format A4. 48. "Technical manual. Truck, 3/4 ton 4x4 (Dodge). Models: WC-51, WC-52, WC-53, WC-54, WC-56, WC-57, WC-59, WC-60. ", Washington, 14.11.1942. . English. 350 pages. 49. "Automobiles Ford A and Ford AA ". 1930. 64 pages. 50. "Practical management(manual) on service of automobiles a Ford And and Ford AA". 1930, 128 pages. 51. "Betriebsanleitung fur den Personenkraft wagen EMW 340-2". Leipzig, 1955. 160 pages. German language. 52. "The small-displacement automobile KIM-10 . The instruction on service." 1941. 72 pages. (About 1 Moskvitch!!!). 54. "Automobile GAZ-61". 1941. 32 p.
55. "Automobile GAZ-67Б". 1955. 188 pages. 56. "Automobile Willis". 1947. 192 pages. 57. "Motor scooter "Vyatka" model VP-150. The instruction on operationn". 1964. 134 pages. 58. "Motor scooter "Vyatka" model VP-150. The instruction on operationn". In Russian and English languages parallel. 292 pages. 59. "Motor scooter "Tula" T-200M. The description and The instruction on operation". 1962. 102 pages. 60. "The catalogue of spare parts cargo Motor scooter "Vyatka" model MG-150". 1961. 79 pages. 62. "Cargo Motor scooter "Tula" TG-200. The brief description and The instruction on operation" . 1962. 107 pages. 63. "Motorrad EMW R 35-3". 1955. 143 pages. German language. 64. "NSU motorrad werke". 1932. 70 pages. German language. 65. "Harley-Davidson, Directory for a motorcyclist". 1926. 126 pages. 66. " The instruction to a motorcycle a TIZ AM-600 ". 1938. 89 pages + 26 pages the drawings. 67. "The instructionпо a motorcycle a M1A". 1949. 28 pages. + 28 pages the drawings. 68. "The instruction on adjustment and operation of a motorcycle L-300". 1937. 34 pages. 69. "Ij-56 and Ij-Upiter. The device, service". 1961. 208 pages. 70. "Motorcycle Ij-8. The instruction and operation". 1938. 46 pages. 71. "Repair of motorcycles a Java". 1971. 303 pages. 72. "Motorcycle Ij-9. The instruction and operation". 1940. 52 pages. 73. "Motorcycle Ij-7. The description and practical management(manual)". 1936. 86 pages. 74. "Motorcycle PMZ-750. The device and operation. ". 1938. 88 pages. - ?Probably book is not present. 75. "Motorcycle "HARLEY-DAVIDSON" model WLA-42. A management(manual)" 1946. 111 pages. The price: 30 Euro. 76. "Soviet automobiles. The directory. "In the book the detailed data on all models of soviet automobiles a GAZ, ZIS, YaG and KIM, made up to 1946 are resulted (GAZ-A, GAZ-11-40, GAZ-03-30, GAZ-AA, GAZ-61, GAZ-M-1, GAZ-60, GAZ-67, ZiS-101, ZiS-5, ZiS-6, ZiS-8, ZiS-16, ZiS-32, ZiS-42, YaG-6, KIM-10...). On each mechanism and unit of the automobile in the directory are given a characteristics of the mechanism; the analysis of his(its) features; digital materials on the sizes, parameters and parities(ratio); some items of information of settlement, research and operational character, and also item of information on materials and processes of processing of the basic details. The basic circuits and principles of action of complex(difficult) units, mechanisms and systems are given. On each mechanism the items of information on all adjustments and about the order of their performance are resulted. The constructive part is submitted by the assembly drawings of units and mechanisms..
77. "ZiS-6". 1940. 88 pages. 80. "Automobile GAZ-M1" . 1940. 188 pages. The price: 36Euro. 81. "Adjustment of automobiles "Moskvitch"". (О 402 and 407 моделях). 1963. 80 pages. The price: 20 Euro. 82. "Motorcycle PMZ A-750. Regulation and contents in serviceability" 1936. 62 pages. The price: 25 Euro. 83. "Automobile ZiS-101". Armand, Aizenberg. 1938. The book in Russian. 263 pages with the drawings and photo. It from the description of the book. " The Book contains the description of a design of the car of a factory by him(it). The Stalin. New mechanisms, as: the carburettor, dempfer, the shock-absorbers etc. distinguishing the automobile a ZIS -101 from other types of soviet automobiles, are described in more detail. The instructions(indication) on adjustment of mechanisms and leaving, and also the materials under the admissions, landings(plantings) and bearings supplement the description of a design.. In last chapter of the book - catalogue of spare parts a ZIS -101. " = 43 Euro. 84. "The atlas of designs of soviet automobiles. A part 4. The chassis."1951. 54 pages format A3 ( =108 pages format A4). In the basic description and exact drawings chassis of the automobile ЗиС-110. The price: 32 Euro. 85. "Motorcycles K-750, M-61, M-62.". 1962. 206 p. The description of designs of heavy motorcycles With carriages M-61, M-62 and K-750 let out Irbit and Kiev motor-factories is given. The rules operation, maintenance, driving are given, the instructions(indication) and advice(councils) on elimination of malfunctions are given. Is undressed devoted to adjustment of units and units of these motorcycles. There is a chapter describing sports motorcycles let out on the basis of road models Irbit of a factory! Price: 34 Euro. 86. "The instruction on operation of a motorcycle Harley-Devidson 74 Twin Model". ~1926 -1932 год. 40 p. Price: 19 Euro. 93. The automobile ZAZ-965A. The operation manual and repair. 207 p.1967. 94. Automobile "Moskvitch. Models 407 and 423H. Maintenance manuel." 192 pages. 1960. On English and in French languages. Price: 40Euro. 96. Management, service and repair of the automobile "Moskvitch". 1951. 224 p.
98. Automobiles a ZiL-111 and ZiL-111A. 367 p. 1961. 99. The atlas of designs of soviet automobiles. Chudakov. 1938. 100. History of the Studebaker corporation, 1924. Erskine, Albert Russel. 229 p.
101 "Catalogue sales-houme Aarona Biber". (Bicyles) 1908 . 28 pages. 102 "Catalogue sales-houme "Pobeda"". (Bicyles, motorcycles, авто) 1909. 16 pages. 103 "Roads Bicyle ZiF. Male and female. Manual" 1953 . 53 pages . 104 "Motorcycles". Jigarev, Korzinkin. 1956 . 256 pages. 106 "A feed of engens. Carburettors and Carburettions". Orlovsky. 1924. 144 pages. + 90 figures. 108 " Manual к смазке automobil". USSR 1925 . 77pages. 109 "Automobiles rouds". Nekrasov. 31 . 62 pages. 110 "Индивидуальное обучение вождению automobil", Плеханов, Папмель. 1955, 95pages. 111 "Repair motorcycles", Pavlov, Ginzburg. 1951. 325 pages. 112 " Обслуживание моторов", Berger. (Это об электромашинах) 1943 . 92 pages. 113 "That it is necsessary to know motorcycle driver". Шурихт. (Transleition in german ).1930 . 133 pages. 114 Статья "Эволюция motorcycle" из "Британско-Русского журнала" сент.1935. 5 pages. 115 Журнал "За рулём" № 3-4. февраль 1938 года. 118 Окраска and противокоррозионная обработка. А.Ф. Синельников. 1994. 128 pages. В книге изложены материалы позволяющие самостоятельно восстановить лакокрасочную поверхность. Правильный антикор. Консервация. Шпатлёвки. Грунты. Эмали. Нитрокраски. Растворители. Подготовка к покраске. Инструменты. Приспособы. Советы. Для лиц занимающихся repairом automobiles. Price: 30Euro. 119 Automobiles ZAZ 968M, 968M-005. Sheynin. 1986. 223 pages. Price: 25Euro. 120 Automobil Moskvitch-403. Конструкция and техническое обслуживание. Andronov. 1965. 403 pages. Price: 41Euro. 121 Manual по repairу Moskvitch-407. Shop manual Moskvitch-407. 196?. Format A4. 352 pages. On russian and english. Price: 131Euro. 122 Catalogue деталей легкового automobil "ЗАПОРОЖЕЦЬ" ZAZ-965A, -965AB, 965AR. 1971 . Format A4. 193 pages. Price: 41Euro. 123 Catalogue запасных частей automobiles"MOSKVITCH" моделей 407, 410N, 411, 423N and 430. Инженер U.A. Halfan. Главный конструктор МЗМА А.Ф. Андронов. 1960. Format A4. Аж 483 pages. Price: 180Euro. 124 Automobil "ЗАПОРОЖЕЦЬ" ZAZ-965A and 965AB. Manual по operationи and repairу. Sheynin. Kaufman. 1968 . 218 pages. Price: 30Euro. 125 Automobil "ЗАПОРОЖЕЦЬ" ZAZ-965A. Устройство, техническое обслуживание and repair. Kaufman. 1969 . 336 pages. Price: 40Euro. 126 "Automobil "VOLGA". Model M-21A and M-21I. Instruction. 1959. 144 pages. Price: 22Euro. 127 Regulation automobiles"Volga" and "Chayka". Nikitin 1964. 96 pages. Price: 15Euro. 128 Electronics in automobil. A.A. Enin. 1968. 48 pages. About first sistem electronical of ignition , reley-regulator and etc. Price: 8 Euro. 129 The textbook the auto fun. Karyagin, Solovyov. 1950. 248 pages. Price: 32 Euro. 130 Americans automobiles operation. Manual for war-drivers. Kedrov V.N. 10 OYAP, citi Groznyi - 1944. 158 pages. Price: 22 Euro. 131 Automobil (USSR). Part 1. Engines. Chudakov. 1937. 247 pages. Price: 32 Euro. 132 Automobil (USSR). Part 2. Fuel equipment, electrical. Chudakov. 1936 . 303 pages. Price: 40 Euro. 133 Automobil (USSR). Part 3. Chassis. Chudakov. 1937 . 240 pages. Price: 32 Euro. 134 The device of automobiles. Anohin. 1957. 611 pages. Format 175 x 265 mm . In book the description принципа действия and the device механизмов, систем and агрегатов USSR automobiles. В качестве примеров конструкции приводится the description the device automobiles"Moskvitch", M-20 "Pobeda", M-21 "Volga", ZiM, ZiL-110, GAZ-51, GAZ-63, GAZ-69, UralZiS-5, ZiL-150, ZiL-151, MAZ-200 and YaAZ-210, and automobiles-самосвалов and autubus. Приведены сведения по их возможным неисправностям and уходу. Price: 150 Euro. 135 General Motors - new model 1959. Дженерал Моторс - новые models 1959 года. Научно-исследовательская работа. Инженерное искусство. Стилизация. 1959. 36 pages. формата 215 на 95 мм. Альбомного расположения брошюра которая в её английском варианте была разослана акционерам корпорации General Motors одновременно с появлением новых моделей 1959 года. Брошюра на русском языке (эта) распространялась среди посетителей Американсой выставки в Сокольниках (в Москве) в сентябре 1959 года. Даются описания and рисунки: Шевроле 1959 года (Импала, Парквуд, Бискэйн, Корвет); Понтиак 1959 года (Бонневиль, Стар Чиф, Каталина Сфари, Каталина); Олдсмобил 1959 года (Динамик 88, Супер 88, Динамик 88 Фиеста, Супер 88 Холидэй); Бьюик 1959 года (Инвикта, кабриолет Инвикта, Ле Сабр, Электра); Кадиллак 1959 года (купе Шестьдесят два, Эльдорадо Беарритц , Флитвуд шестьдесят особый, Эльдорадо Брогам); Воксхолл 1959 года (Воксхолл Виктор, Воксхол Виктор Супер); Opel 1959 года (Олимпия рекорд, Караван). Price: 10 Euro. 136 "Automobil Volga GAZ-21. Manual" 1963. 130 p. Price = 25Euro. 137 Automobil Moskvitch. Model 402. 1956. 172 pages. 138 For Driver about new car Moskvitch 402. U.A. Halfan. 1956. 156 pages. 139 Automobil "Volga". Borisov, Gor, Nevzorov, Solovyov. Avart. 1964, 427 pages. 140 Pasport car radio A-12 (USSR). 1962. 23 pages. 141 Atlas cars rouds USSR. 1967. 166 pages. 142 Automobil "Volga" models M-21L, M-21T, M-22 and M-22B. Instruction. 1963. 127 pages. 143 Manual about rules the traffic regulations. 1967. 144 pages. 144 Rules the traffic regulations on streets of cities occupied items and rouds USSR. 1960. 139 pages. 145 Rules the traffic regulations on streets and rouds USSR. 1964. 107 pages. 146 Rules the traffic regulations. 1976. 224. 147 Catalogue spare parts automobil "Volga". M-21L, M-21М, M-21P, M-21T, M-22, M-22B. 1964. 256 pages. A4. 148 The description "Набора приспособлений для repair automobil "Volga" M-21.". 1971. 20 pages. 149 Automobil Moskvitch 403. 1965. 403 pages. 150 Automobiles Moskvitch 403, 424, 432. 1964. 146 pages. 151 The directory driver-fun. Shestopalov. 1956. 236 pages. 152 US Army, NAVY, Air Force 1967-1968. war hronic (english language) - 25. 191 pages. And about tanks, and etc. 153 The directory driver. 1972. 400 pages. 154 The textbook driver 3-class. 1963. 448 pages. 155 Тормозные качества automobil. U.A. Halfan. 1965. 81 pages. 156 Automobil M-20 "Pobeda". Lipgart.1954. 312 pages. 157 USSR automobiles. Anohin. 1977. 592 pages. 158 SKODA 440. 1956. Manual. English. 72 pages. 159 SKODA 440-445. 1958. List of spare parts. 4 language: English+France+Chechoslovakia+German. 252 pages. 160 Gans Great Victory (USSR). 1972. 30 pages. Many fotos. About tanks, mortire, air, ships USSR 2 WW. 161 Automobil hours "A.Ch.V" (USSR). Instruction for montage and operation.1960. 6 pages. 162 Опись пломбируемых мест and комплектности automobil M-21 "Volga". 1960. 1 pages. Очень интересный документ. 163 Упаковочный лист на driverский инструмент and принадлежности automobil "Volga". 1960. 2 pages. A4. 164 Automobil radio A-12, model 1959. Manual and Instruction for car radio. 1960. 24 pages. + shem 12 pages. A4. 165 Automobil GAZ-12 (ZiM). Instruction. 1959. 122 pages. (Sorry: not have pages 1-5 in book!). 166 Repair automobil GAZ-69-68. Manual. 1973. 519 pages. 167 Карта смазки automobil GAZ-69. 1973. 1 pages. A4. 168 Automobil "Volga". Models M-21А (taxi) and M-21I . Instruction.1960. 120 pages. 189 Table 1: "Parts automobil M-21 = Parts automobiles GAZ-24, GAZ-53, GAZ-66". 6 pages. Price: 5 Euro. 170 Table 2: "Parts automobil M-21 = Parts automobiles GAZ-24 and GAZ-3102". 3 pages. Price: 5 Euro. 171 GAZ-14 "Чайка". "Chaika" GAZ-14 Parts catalogue. Catalogue des pieces detachees. Teile- und baueinheitenkatalog. Catalogo de piezas y unidades de ensamblaje. In 5 languages. Format A4. 471 pages. Copy = 100 Euro. Original = 200 Euro. 172 Краткое руководство по автомобилю ДОДЖ моделей WC-51 и WC-52, 3/4 т (4х4). 1946. 87 стр. Цена: 30 Euro. 173 Метро Москвы. 1947. 179 стр. Очень интересно, оказывается были такие названия станций метро в Москве: "Завод имени Сталина" (теперь "Автозаводская" и, кстати, тогда это была конечная "Замоскворецкого радиуса"), ещё станция "Ц.П.К. и О. им. Горького", ещё "Измайловский парк имени Сталина", ещё станция "Сталинская"... Цена: 35 Euro. 174 "The Motor. The National Motor Journal". #1467(febreary 1930) - #1492(july 1930). 1244 стр. формата А4. На английском. Это подшивка журналов в твёрдом, фирменном переплёте. Огромное количество фото и рисунков. Можем отксерить хоть один журнал из этого переплёта. Цена копии одного журнала 40 Euro. 175 "The Motor. The National Motor Journal". #1493(august 1930) - #1513(december 1930). 1012 стр. формата А4. На английском. Это подшивка журналов в твёрдом, фирменном переплёте. Не хватает то там то сям страниц 40. Огромное количество фото и рисунков. Можем продать оригинал этот (весь переплёт из 18 журналов) за 500 Euro. 176 OPEL KADETT. Betriebs-Anleitung. Ausgabe 1939. Kadett-KJ 38. Kadett-K 38. На немецком. 82 стр. Много фото. Цена: 35 Euro. 177 Автомобильный спорт в СССР. Справочник. Л. Шугуров. 1976. 240 стр. Много фото. Цена: 40 Euro. 178 AUDI 3,2 Liter. Bedienungsvorschriften. 86 стр., + карта смазки, + электросхема. Примерно 1937-1939 годы. На немецком. Цена: 35 Euro. 179 Зажигание смеси в цилиндрах в автомобильных, авиационных, мотоцикловых, лодочных и в подобных им двигателях внутреннего сгорания. 1925. 160 рисунков в тексте. 240 стр. Цена: 40 Euro. 180 Название неизвестно - у этой книги нет: обложки, первых 22 страниц и последних (после 240 страницы). Но книга удивительная. Авторы: Д.М. Юделев, Я.Х. Закин. 1948-1949 годы. По содержанию похожа на книгу Хальфана "Описание конструкций автомобилей иностранных марок". Но эта больше и состав машин несколько другой описывается: Адлер Примус 1,7A и 1,7E, Трумпф 1,7AV и 1,7EV, 2л, 2,5 л, Ауди Фронт и 920, БМВ 320, 321, 326, 327, 327/28, 335, Вандерер W23, W26, W52, W24, W35, W 40, Ганомаг 1,3 л, Рекорд 15 К, Штурм 23 К, Гарант 11/36; Ганза-Ллойд (Боргвард) 1100, 1700, H 3200 P, 6M 2P; DKW, КдФ (Фольксваген); Мерседес-Бенц 170, 230, 320, Опель, Татра, ФИАТ, Форд Таунус, С-Эйфель, V8-48, Хорьх 830R, 930V, Штеер 50, 200, 220, Штовер R180, Грейф-Юниор, Аркона, Седина, Виллис MB, Майбах, грузовики - Бюссинг-Наг, Крупп, Мередес-Бенц, Татра, Феномен, Форд, Студебеккер, Опель-Блитц. Сравнительные характеристики Майбах и Хорьх по испытаниям и эксплутации. Характерные поломки для всех означеных машин. Таблицы смазок. Подробностей очень много. Цена: 65 Euro. 181 Handbuch fur Kraftfahrer. 1925. 100 стр. О машинах и даже тракторах старинных, в т.ч. на гусеницах. На немецком, готическим шрифтом. Цена: 30 Euro. 182 Карбюрация в автомобильных двигателях. Сокращённый курс. 1933. Авиаавтоиздат. 115 стр. Цена: 25 Euro. 183 Карбюрация и карбюраторы автомобильных двигателей. 1932. Гострансиздат. 124 стр. Цена: 25 Euro. 184 "Олдтаймеры" - автомобили прошлого. Петер Кирхберг. 1997. Лейпциг. 126 стр. На русском. Как произошёл переход от конных экипажей и паровых автомобилей к мощным "олдтаймерам". Живо. Цена: 25 Euro. 185 Автомобиль и управление им. Грибов. 1927. 218 стр. На примерах: Бенц, Матис, Морис, открытые и закрытые автобусы Лянчия, грузовики Крупп, N.A.G., Makk, Devald, Federal, A.E.C. Цена: 35 Euro. 186 Motor Repair and Overhauling. Part 1. 62 стр. На английском. 1930. Цена: 25 Euro. 187 Микро-Автомобили. Фиттерман. 1961. 272 стр. В книге рассмотрены конструкции автомобилей малого класса выпускаемых в 1961 и до 1961 года. На примерах: Мессершмит КР 200, Бонд Миникар, Изетта, Фульдмобиль NWF 200, БМВ Изетта, Фриски Салон, АС Петит П, Гоггомобиль, Т300, Цюндап Янус, ЗАЗ-965 "Запорожец", Веспа 400, ФИАТ 500, Штеер Пух 500, Ситроен 2CV, NSU Принц, Ллойд LP 600, Чемпион 400, BMW 600, DAF? Майко 500, Моррис Мини Минор, ФИАТ 600, Трабант, Гоггомобиль 600, Рено 4CV, Рено Дофин, Москвич-401, Москвич-407, Фольксваген, Остин-А40, Форд Таунус 12М, Шкода 440, Глиаф 1100, Симка Аронд 1300, Варбург 311/0, "Механический мул" (4х4), "Огонёк" (4х4), НАМИ-059, -048, -049, -А50, -031, Белка, С1А, С3А, Москвич-444. Цена: 35 Euro. 189 Автомобиль "Волга". Устройство и эксплуатация. Невзоров, Соловьёв. 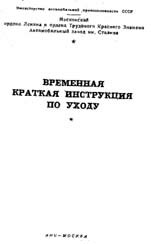 1959 (самая первая книга по ГАЗ-21?). 167 стр. Цена: 35 Euro. 190 Таблица: "Детали автомобиля "Волга" взаимозаменяемые с деталями автомобилей М-20, ГАЗ-12 и ГАЗ-51". 1959. 11 стр. Цена: 10 Euro. 191 Автомобиль ЗАЗ-965 "Запорожец". Устройство, управление, техническое обслуживание и ремонт. Гурман, Сархошьян. 1964. 212 стр. Цена: 35 Euro. 192 Евгений Чудаков. Автор Ю.Г. Алексеев. Книга популярно рассказывает о жизни и деятельности Е.А. Чудакова (1890 -1953) - выдающегося советского учёного в области автомобилестроения и машиноведения, основоположнике советской автомобильной науки. 1983г. 240 стр. Цена: 45 Euro. 193 Легковые автомобили VOLVO. 1927 - 1999. Книга по истории Вольво с множеством фотографий. 94 стр. Цена: 40 Euro. 200 Автомобиль ГАЗ-21 "Волга". 1972г. Красочный альбом формата А3. В альбом включён обширный иллюстративный материал, представленный в наглядной форме (изометрические проекции автомобиля, узлов и агрегатов в многокрасочном исполнении).60 стр. из них 28 стр. иллюстраций. Цена ч/б копии: 40 Euro. И ещё есть всего один оригинал такого же альбома на обмен - на какой либо оригинал книги по автомотостарине. 204 Учитесь управлять автомобилем. Плотников. 1970г. В книге рассказано об истории автомобилизма, описано устройство "современного" автомобиля (на примерах Москвич-408). Описывается как устроить соревнования автомобилей. ГАИшников в книге ещё величают ОРУДовцами. 143 стр. Цена: 40 Euro. 213 Без борьбы нет победы. Mанфред фон Браухич. Ohne Kampf kein Seig. Manfred Von Brauchitsch.1973. Известный в прошлом автогонщик команды Мерседес Mанфред фон Браухич рассказывает от своего лица о: своих встречах с руководством Гитлеровской Германии, известными промышлениками и богемой Третьего рейха, о гонках по всей Европе (в которых он принимал участие с начала 1930 х годов и до 1950 х годов), о команде гонщиков фирмы Мерседес (в т.ч. и о Рудольфе Караччиола), о своей личной жизни, о своей политической борьбе в ФРГ после поражения Германии, о бегстве в ГДР. Интересная книга. На русском языке. 302 страницы. 20 фото. Цена: 90 Euro. 214 Радиовещательные ламповые приёмники. Левитин. 1956. Описываются очень подробно и автоприёмники тех лет: А-695 (для ЗиС-110 на 6 Вольт), А-4 (для ЗиМ на 12 Вольт), А-5 (для ЗиС-110 и ЗиМ на 6 и 12 Вольт), А-8 (для автомобиля М20 "Победа"). Описываеется старинная измерительная аппаратура, тестеры. Описываются стационарные и первые советские носимые приёмники - это нужно видеть! 384 стр. А4. Цена: 85 Euro. 215 Серия советских агит-плакатов "Пьянству - бой!". Примерно 1970 - 1985 г.г. 23 листа А4. Цена: 20 Euro. 216 Каталог запасных частей легкового автомобиля ЗИМ. ( ГАЗ-12 ). 1955. 252 стр. А4. Очень нужная для владельцев ЗИМов, и для ремонтов, реставрации ЗИМа книга. Очень много чертежей и рисунков. Вот кто нибудь знает что багажник у ГАЗ-12 называется официально "чемодан"? Крышка багажника по ЗИМовски это "крышка чемодана". Цена: 130 Euro. 217 Каталог запасных частей автомобиля М-20.1955. Глававтотракторосбыт. 226 стр. А4. Под редакцией гл. конструктора завода имени Молотова Н.И. Борисова. Очень нужная для владельцев М-20 , и для ремонтов, реставрации "Победы" книга. Очень много чертежей и рисунков. Цена: 110 Euro. 225 История автомобильного транспорта России. 1941-1945. 365 страниц. Цена: 50 Euro. И ещё есть всего один оригинал такй же книги на обмен - на какой либо оригинал книги по автомотостарине. 226 История автомобильного транспорта России. 1945-1965. 472 страницы. Цена: 65 Euro И ещё есть всего один оригинал такй же книги на обмен - на какой либо оригинал книги по автомотостарине. 228 Инструкция по эксплуатации двигателя, вышедшего из капитального ремонта. Примерно 1947 год. Касательно обкатки двигателей, смазок и октановых чисел бензина автомобилей ЗиС-110, ЗиМ, М-20 Победа, Москвич, Мерседес-Бенц, БМВ, Бьюик. 1 (одна) страница. Цена: 5 Euro. 229 Автомобиль "Москвич" моделей 407 и 427Н. Каталог деталей. Moskvich automobile models 407 and 423H (423N). Parts Catalog. На русском и английском языках одновременно. Russian + English. 305 страниц формата А4. Цена: 140 Euro. 232 Краткий справочник шофёра любителя. Альбощин, Лепская. 1954 год. 173 стр. Цена: 40 Euro . И есть один лишний оригинал на обмен. 255 Справочник мотоциклиста. Деменьтьев, Юмашев. 1957 год. "Выполняя указание партии и правительства, наша промышленность неуклонно увеличивает производство мотоциклов. Шестой пятилетний план развития народного хозяйства предусматривает выпуск мотоциклов в 1960 году в количестве 395 000 штук." Описываются характеристики, особенности и агрегаты на примерах мотоциклов М 1 АК-125, Л-55, ИЖ-49, М-72, мотороллеров Вятка-150, Тула-200. Их ремонт, разборка и сборка. 311 стр. Цена: 70 Euro. 256 Эксплуатация и ремонт мотоциклов. Гинцбург, Павлов. Машлит, 1953 год. "Книга является руководством по обслуживанию и ремонту мотоцикла в условиях индивидуального пользования." На примерах мотоциклов: М-72, ИЖ-350, Иж-49, К-125, М1А, Л-300 "Красный октябрь", АВО-425, БМВ Р-35. 396 стр. Цена: 75 Euro. 257 ЗИС-5 и ЗИС-5В. В книге: Описание создания. Много фото, есть общие чертежи и подробные характеристики. 64 стр. А4. Цена цветного оригинала книги: 50 Euro. Цена копии: 40 Euro. 258 Автомобиль ГАЗ-М20 "Победа". В книге: Описание создания. Много фото, в т.ч. салона, есть общие чертежи и подробные характеристики. 63 стр. А4. Цена копии: 40 Euro. 259 ГАЗ-69/69А. УАЗ-69/69А В книге: Описание создания. Много фото, есть общие чертежи и подробные характеристики. 48 стр. А4. Цена копии: 40 Euro. 260 ГАЗ-51. ГАЗ-63. В книге: Описание создания. Много фото, есть общие чертежи и подробные характеристики. 64 стр. А4. Цена копии: 40 Euro. 261 Автомобиль ГАЗ-М1. В книге: Описание создания. Много фото, есть общие чертежи и подробные характеристики. 64 стр. А4. Цена копии: 40 Euro. 262 Подшипники и сальники применяемые на автомобиле "Волга" (ГАЗ-21), их обозначения по ГОСТу и взаимозаменяемость с подшипниками и сальниками М20 Победа, ГАЗ-69, ГАЗ-12 (ЗиМ), ГАЗ-51, ГАЗ-63А. 3 стр. Цена: 10 Euro. 278 507 механизмовъ встречающихъ применение (в динамике, гидростатике, гидравлике, пневматике, паровыхъ машинахъ, при устройстве мельницъ, прессовъ и другихъ многихъ машинъ, орудий, а равно при разных оборудованияхъ и производствах (фабрично заводскомъ и кустарномъ). Henry T. Brown. 1902 год. Описываются всякие простейшие и хитроумные механизмы и орудия с использованием блоков, палиспастов, ремней, рычагов, веревок, ковшей, зубчатых колес, шестерен и т.п. около 500 рисунков и чертежей. На дореволюционном русском языке. 183 стр. Цена: 100 Euro. 287 Регулировка рулевого управления ДКВ. Инструкция на русском языке для автомобиля. Примерно 1940 год. 1 стр. А4. Цена: 4 Euro. 290 Инструкция по установке комбинированного комплекта поршневых колец с маслосъёмными кольцами из стальной ленты при сборке двигателей ЗМЗ-21А (номер 21-1004082 Р1, Р2, Р3). 1971 год. 1 стр. Цена: 5 Euro. *** Attention! The money send by you for the literature will be is spent by a Museum only for payment of post delivery, printed works, Increase and updating of library of a Museum. It is noncommercial, charitable, enlightening activity. Basic task of library of a Museum - education. *** How to receive the book? You have friends in Moscow? Let they will pay the order by cash money. Other way we have not found. The foreign and Russian banks plunder a museum. The state too plunders our museum. If you will think up as us to receive money. Inform us. The address : Russia. 109559. Moscow. Krasnodarskaya street, vladenie 58. "Lomakov Museum of Antique Cars and Motorcycles", Mr. Lomakov Dmitry . ***Some books we can translate. For the separate fee. You can help to a museum - place the pages address on a Museum and Club on your pages!